California Girl and I had our first vacation together in a destination outside North America since 2004, when we visited Sirmione in Italy. 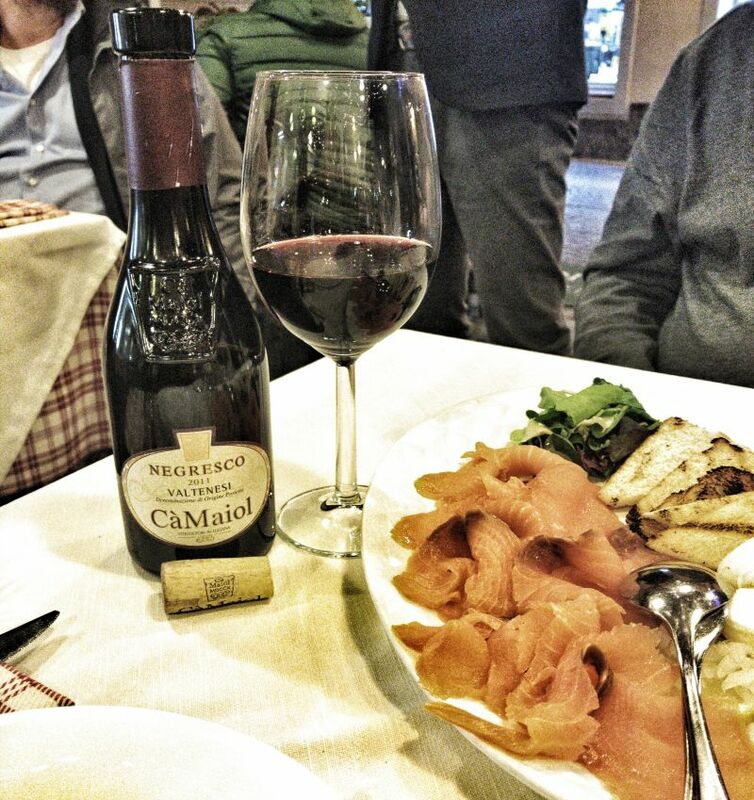 This post is about our experiences dining in Sirmione and all of the amazing food we enjoyed. Sirmione sits on a peninsula that sticks out of the Southern shore of Lake Garda, the largest of the Italian lakes. 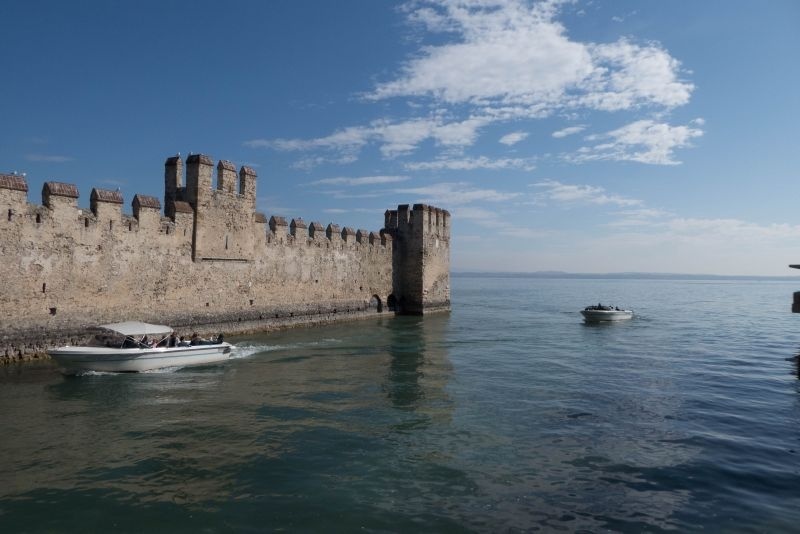 Sirmione has a long history; the Thirteenth Century castle that guards its Southern approach was built from stone scavenged from a villa built in the First Century BC. The only land entry to Sirmione is through an archway in the castle. The arch is barely wide enough for a car to pass through, especially at weekends when people on foot wander in and out paying no heed to motorized vehicles. 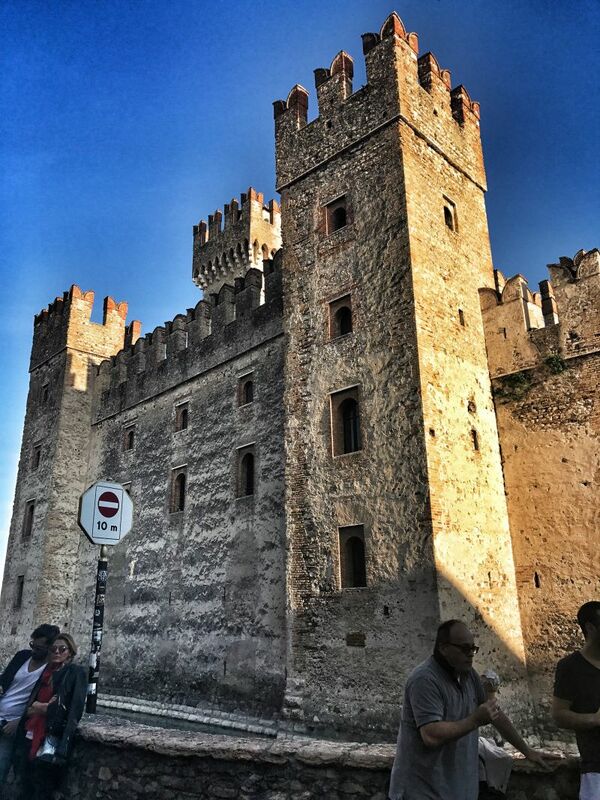 The combination of its history and location, with the waters of Lake Garda on all sides mean that Sirmione is a town focused on holiday-makers; most of the buildings are hotels, tourist shops, or places to eat and drink. 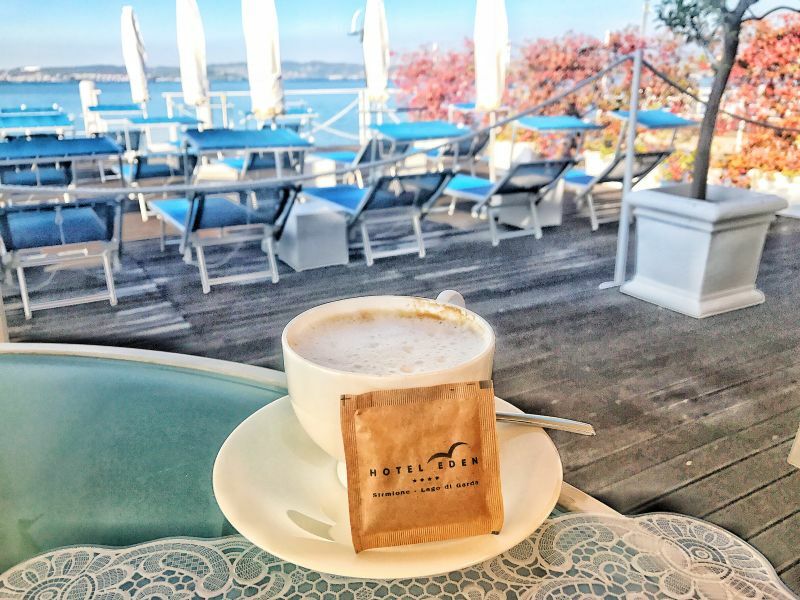 The warm climate, which we can testify continues into mid-October, means that many of these cafes and restaurants have ample outside seating. During our stay, we tried to dine at as many different places as possible; although one place was just too tempting to avoid a return. 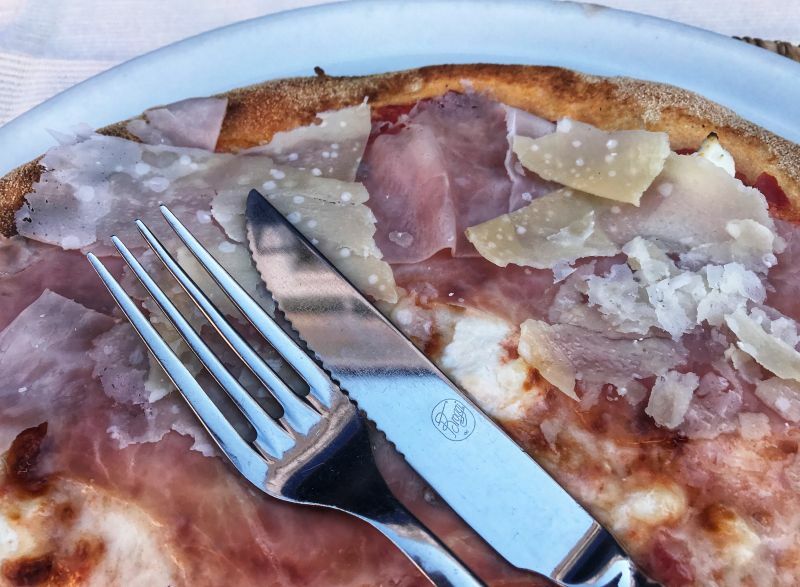 Italian menus, at anything more than the most basic bar, are structured into the following courses: antipasta, primi piatta, secondi piatta, and dessert. The anti here meaning before past; no Italian restaurant would be opposed to pasta. The primi plata is the pasta course, whilst the secondi plata is the main course of meat or fish. 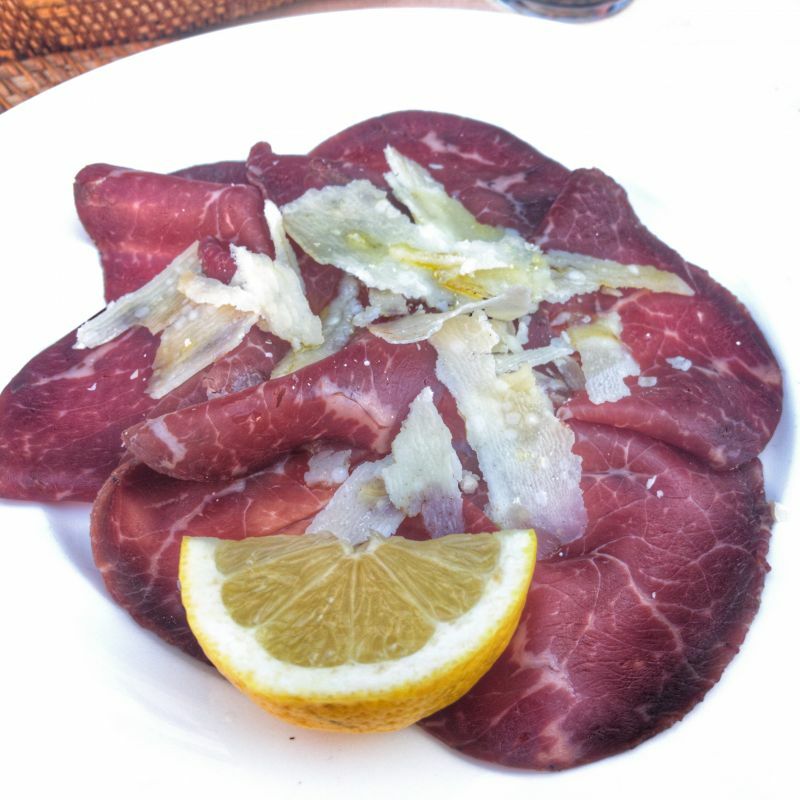 Several restaurants in Sirmione split the main course into three sections; meat, a la mare, and a la lago; the last offering fish from the lake as distinct from fish from the sea. Most of the places we visited also had a pizza section. Since we were eating lunch and dinner in restaurants and started each day with an excellent breakfast from our hotel, neither California Girl nor I could manage all four courses. We would have a starter, and then pick one of the other courses; pasta, main, or pizza. More often than not, we would share dishes. Not only did no one raise an eyebrow at this request, but many places brought us the food already split into two plates. Our first meal in Sirmione was lunch on the day that we arrived. We picked the place at random and it was our only disappointment. The pizza crust was soft and the toppings bland. The spaghetti carbonara was as California Girl put it more dent your teeth than al dente. Given the wide range of choices, we recommend that you avoid “Snack Bar da Mario”. Our negative appraisal of this place was confirmed as every subsequent cafe, bar, or restaurant served far better food. California Girl was intrigued but baffled by the pizza crust at “Caffé Margherita Pizza”. We tasted a slightly sweet spiciness in the crust. It turned an excellent pizza into something extraordinary. I have often seen people pull off the edge of a pizza crust, leave it on the side of the plate, and focus on eating the part of the pizza with toppings. California Girl was doing the reverse, eating the crust by itself as she tried to determine the magic ingredient. Defeated she tried, without success, to charm the secret from the waiter. The smoked salmon starter at “San Lorenzo” was especially noteworthy, both in terms of quantity and the quality of the fish; cut thick and with a subtle smoke that enhanced the fish flavours. After we dined there on our first night, we returned for lunch a couple of days later and had the smoked salmon again as the main course. Before settling on San Lorenzo for our dinner on Saturday night, we had looked at “Trattoria La Fiasca”, but this small place was clearly packed so we moved on. We headed out earlier on Sunday and whilst busy there were some empty tables. 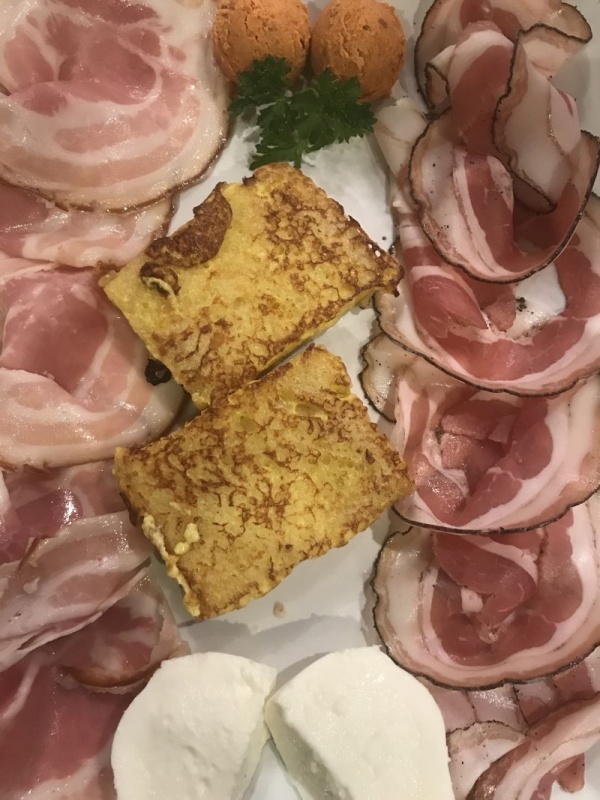 We had a truly unusual starter, two types of bacon with mozzarella cheese, french toast, and a red pepper butter. The combination of flavours and textures was a delight and as a shared plate was a suitable size for an appetizer. 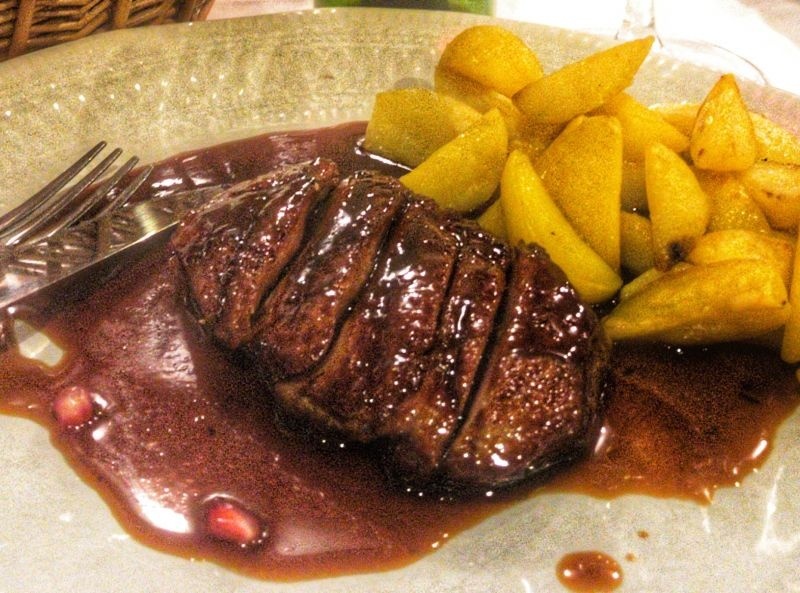 The main course was duck in an orange and honey sauce with roast potatoes as a side. The roast was far lighter than the traditional English approach, but the flavour and softness of the potatoes was first rate. To English ears calling a restaurant “Fiasca” may seem odd, but in this context, it is the name given to the straw basket that traditionally held Chianti bottles. 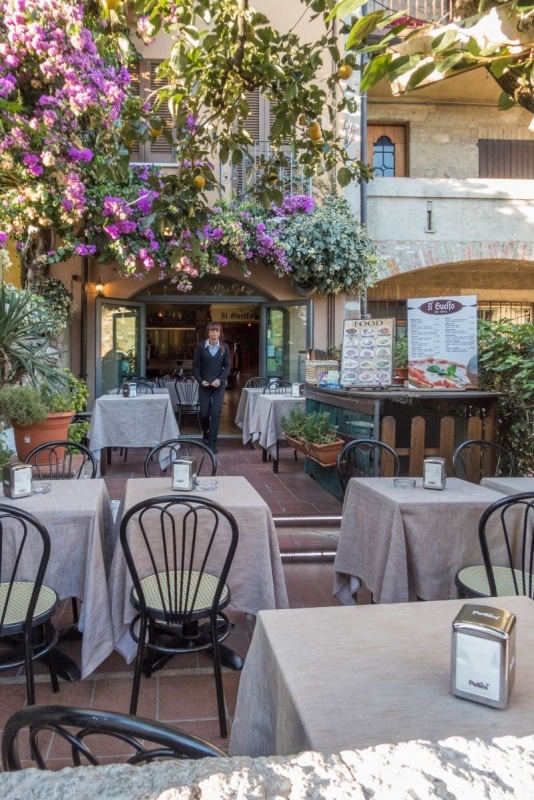 The explanation that I provided above on how Italian menus are structured may seem unnecessary to many readers, but there is at least one Sirmione restaurant who would benefit from reading and understanding that section. We went to “Girasol” for an evening meal. We ordered a starter to share, California Girl asked for pasta as the main dish, and I picked suckling pig for my main course. We would have understood if the three dishes had arrived in that order, but what happened was that after a long wait with just the bread and excellent wine to keep hunger at bay, the starter and my main arrived. California Girl had the starter we had asked to share plunked in front of her. The suckling pig was delightful, juicy meat, excellent roast potatoes, and a drizzle of balsamic to give the dish a kick. I was focused on savouring my food, so the sharing of the starter was limited to me taking a single bite. After our plates were cleared and another wait, California Girl received her pasta dish. By this time her appetite was gone and after a few mouthfuls, she was defeated. Excellent food, but haphazard service. On our first day, we had spotted a restaurant with a menu full of items that appealed. We decided to keep it for a special evening; we were too tired on our first night to enjoy a full meal. We always found other places to eat until our last night, then we found that the place was dark as it closes on Wednesday. This turned out to be a blessing, for we had our last lunch in Sirmione at this place; “Il Grifone”. Large windows gave us a view of the castle, the beach, and the gently lapping waters of Lake Garda. We would not have had the view if we had visited at night. 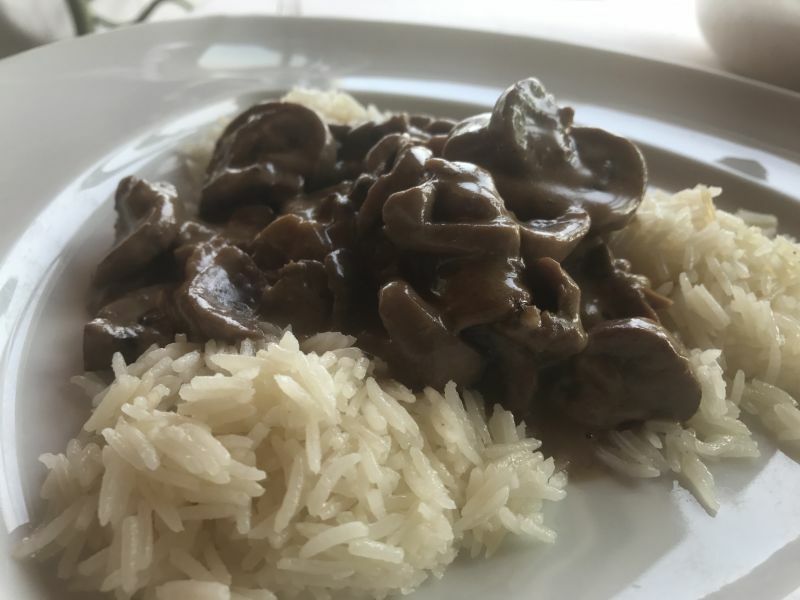 I had a rare opportunity to eat calves kidneys; served in a simple white wine sauce on a bed of rice. We finished the meal with an espresso and for California Girl, a cappuccino. 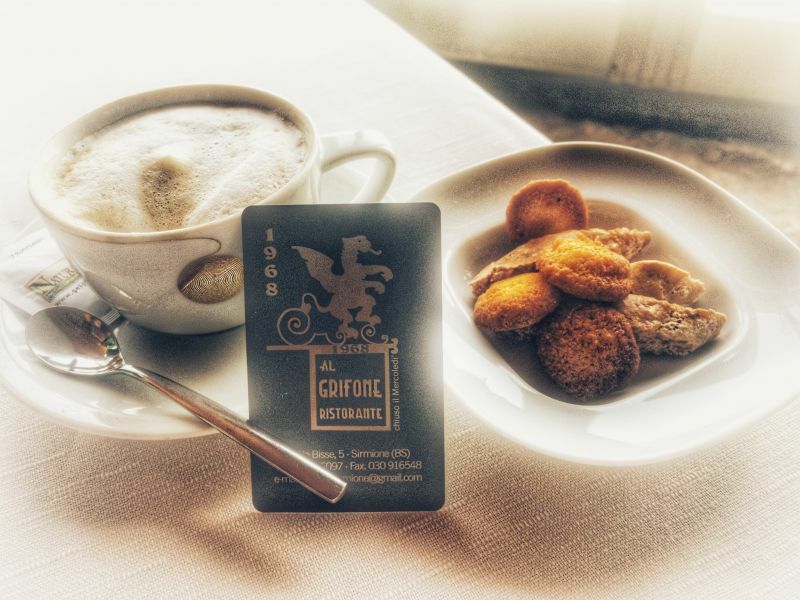 The coffee was served with a small cookie made of cornmeal, flavoured with lemon, lavender, and a kick of ginger. In a town full of beautiful places to eat; this one wins our best view award. 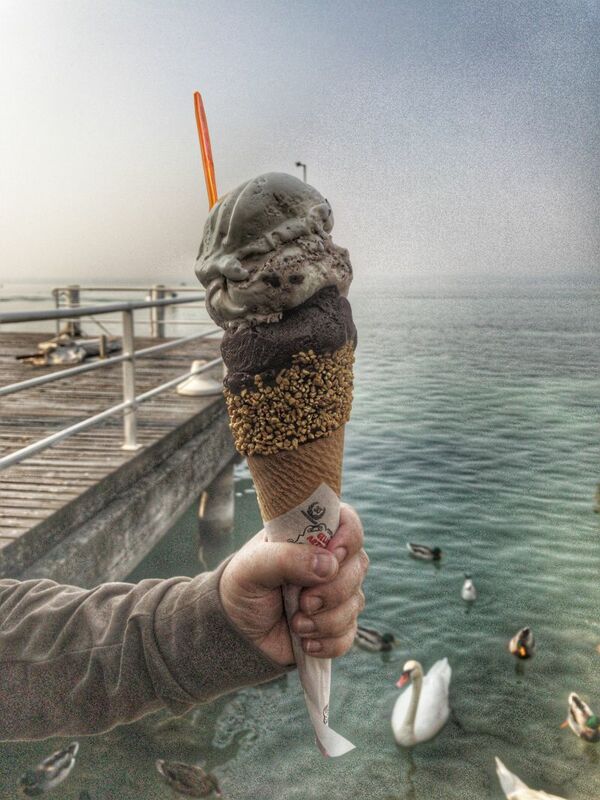 California Girl comments: I couldn’t let this post go without talking about the Gelato (ice cream) in Sirmione. We have eaten gelato everywhere and think that this is the best Italy has to offer. There are just as many gelato shops as there are restaurants. Everyone it seems eats it daily. I couldn’t resist buying The Brit an extra large cone. It cost us about $13.00 USD. The amount of enjoyment he got from eating that cone and the smile on his face? Priceless! 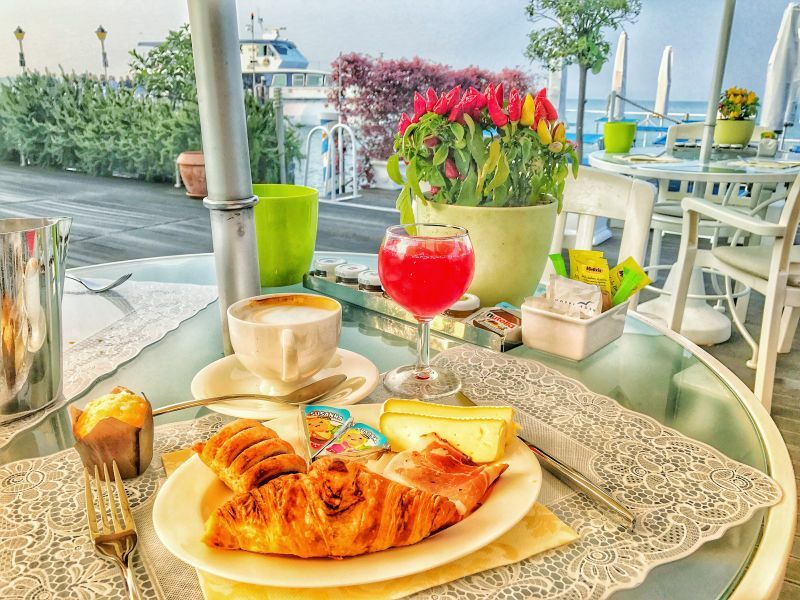 A few things worth noting about dining in Sirmione: the cover charge, getting the bill, tipping, and smoking. All restaurants add a cover charge to the bill, this is usually just a couple of Euros per person and is the price charged for the bread which comes before every meal. Italians treat dining out as an event that should take most of the evening; no restaurant wishes to suggest that it is time to leave, so you need to ask for the bill. The bill is never brought un-requested. If you pay for your meal with a credit card, there is no option to add a tip to the bill, so you need to leave cash. Finally, the Italians have an archaic approach to smoking in restaurants. Given the warm weather we encountered, despite it being the second week of October, we frequently sat at tables outside. However, smoking is allowed at these tables, despite the presence of people eating. There was at least one occasion when we left more quickly than we otherwise would have done because the table next to us lit up. 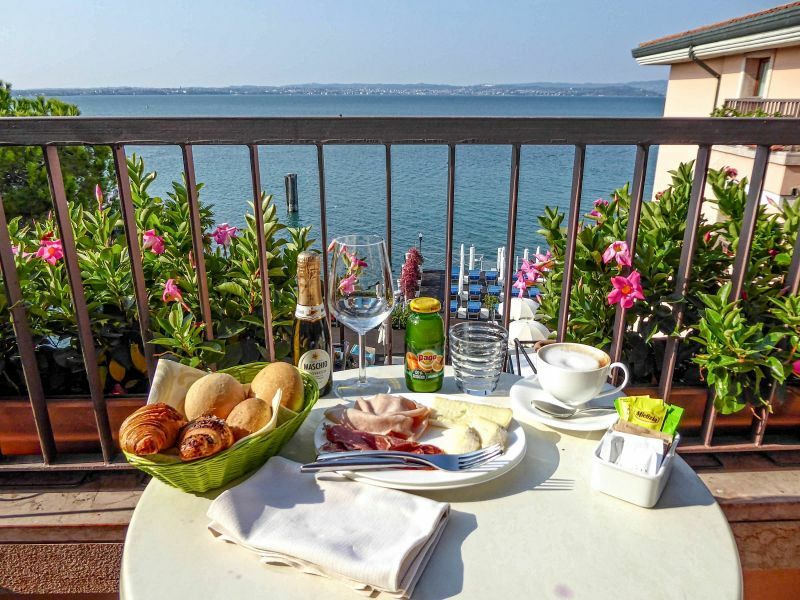 Eating well in Italy is almost a given and Sirmione adds beautiful views to the cuisine. Even a dish as simple as cold meat and cheese can be remarkable here. Looking at some of the photographs that California Girl took is enough to bring taste memories flooding back. Love all the photos and your description of each place, sounds like a fantastic place to visit!